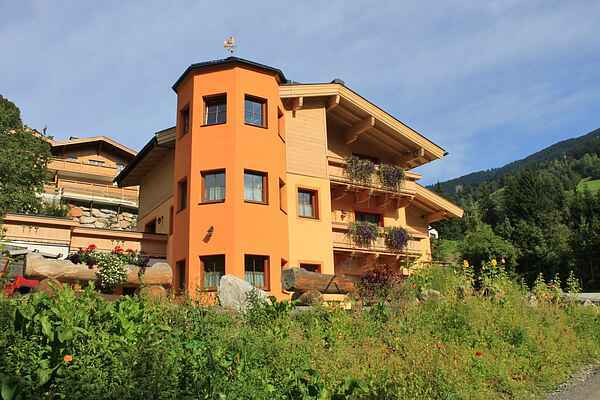 This beautiful holiday house is located right next to the ski slope and the Jausernlift in well-known Saalbach. You will have this spacious holiday apartment entirely to yourself. It has its own entrance and is situated on the first floor, which, due to the location on a slope, can also be considered the ground floor. The spacious living room is furnished in the cosy style of an Austrian "Stubrl". You also have 3 bedrooms, 2 of which have their own bathroom. As an extra bonus, you have a private sauna containing both a Finnish sauna and an infrared sauna as well as a wonderful massage shower to really relax after an active day of hiking or mountain biking. There is a large ski storage area for general use, with ski boot driers. This area can be used for bicycle storage in summer. You can reserve breakfast or dinner every day through the friendly owners, who run a "Jausenstation/Skihut" close to the house. As a ski destination, Saalbach-Hinterglemm certainly needs no introduction. Almost nowhere else offers as many kilometres of ski runs in one place, from early December to mid-April. Whether cross-country skiing, tobogganing or of course the famed Apres Ski... you will find it all in Saalbach-Hinterglemm. In summer there is no shortage of options for hiking and other recreational offerings and most of the attractions in the state of Salzburg are within quick reach.